The 2017 iceberg season has begun — and in less than three weeks it's already almost beat the berg count for all of 2016. Here's how ships and oil rigs adapt. They’ve been the bane of hundreds of ships and a yearly hazard to the offshore oil industry in Canada’s Grand Banks — and a major tourism draw for Newfoundland. Already, more than 600 of these floating mountains of ice have appeared off the province’s north and east shores since late March 2017 — a veritable iceberg onslaught, considering the 2016 season saw a total of 687 between April and September. As always, thousands more are already well into the one- to three-year journey that began with west Greenland’s glaciers, thousands of kilometres to the north. Of the tens of thousands of icebergs calved there each year, about one per cent ride the Labrador Current south through Davis Strait and the Labrador Sea, all the way to the busy transatlantic shipping lanes and oilfields east of St. John’s*. 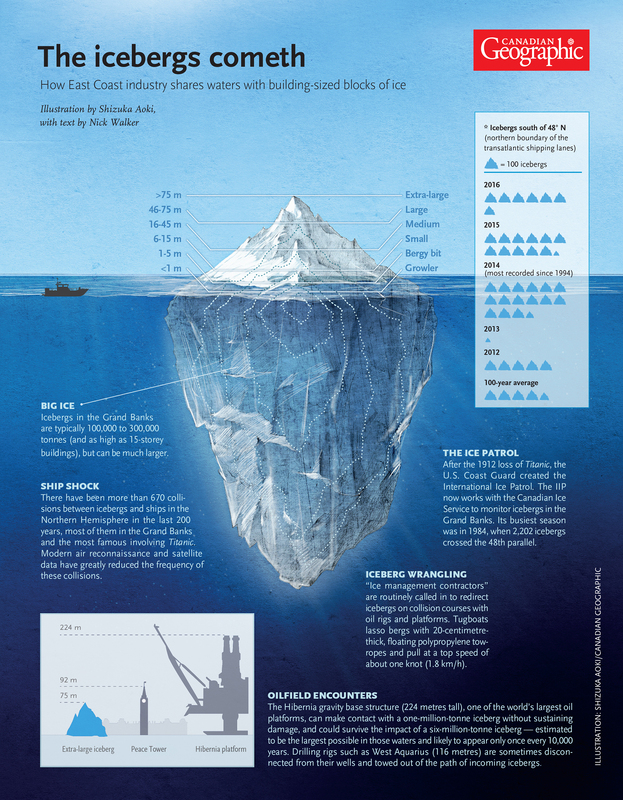 This infographic details how icebergs can affect the region’s industries.